1. The goal for parents is to immediately respond to demands with (a) choices, (b) consequences, and (c) consistent follow-through in order to avoid power struggles and tantrums. If this is a new approach for you, the youngster will probably still have tantrums in response to this new approach. In fact, his reactions may seem to be more extreme before it improves, because he is testing new limits. Your youngster wants to see if you will react differently if embarrassed in public, if he destroys things, if he loses control, etc. 2. Ask, “How would this make you feel.” Ask your kids how they would feel if they were interrupted? If they were woken up? If you talked to them that way? Help them understand how their demanding actions make others feel. 3. Be patient with your youngster. Do not make the mistake of giving up too soon because you do not see the results you want immediately. It is unrealistic to expect your youngster's behavior to change overnight. Persevere in your efforts to teach correct behavior. The time you invest in it will be worth it in the end. 4. Do not allow yourself to get drawn into arguments. 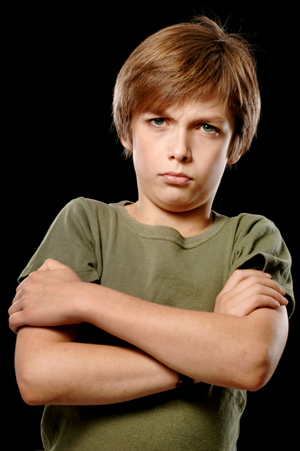 A youngster will resist your efforts to redirect his behavior if “being demanding” has gotten him his way in the past. He may cry, yell, rage, or argue in an attempt to recapture some of his control. Do not engage in power struggles with him. Remind him of your expectations and the consequences for his behavior, and then let him decide if he is going to obey you. 5. Establish appropriate consequences. Your youngster needs to know there are consequences attached to his behavior. Communicate to your child precisely what will happen when he behaves in a way that is unacceptable (e.g., "We will leave the movies if you begin to cry or yell because you can't have any extra snacks"). Be prepared to follow through by walking out of an activity if your youngster refuses to obey. Consequences have to be consistent in order to be effective. 6. Give positive reinforcement. The most effective way to reduce demanding behavior in kids is to strengthen desirable behavior through positive reinforcement. Be aware of your youngster's efforts to improve his behavior and give sincere compliments when he succeeds. 7. Avoid vague reprimands such as "act your age" or "behave yourself." Instead, give your child a clear picture of his unacceptable behavior by using descriptive language (e.g., “You are shouting at me because I won't let you stay up past your bedtime. This is not appropriate."). 8. If moms and dads allow the natural consequences of a situation to occur, the parent is not the one exerting the control – nature is. The parent can now face the situation calmly and from a detached position of presenting the youngster with his choices and then letting him experience the consequences of his choice. 9. Is your youngster demanding because that is how you talk to them? Evaluate the way you talk to your kids. We might find that we are relentless and demanding in our communication, and our children are just copying us. 10. Is your youngster demanding because he doesn’t feel he is getting enough attention? Take time to listen to him without multitasking. Sit down, look him in the eyes and just listen. Laugh together, watch his eyes, and observe his story-telling actions. Forget about the laundry. 11. Make it really clear that a demanding, whinny, relentless voice will not be tolerated. If they have a request, it has to be made in a “nice voice.” And, saying things once will suffice. Don’t acknowledge demanding relentless requests. Before you start enforcing, teach your youngster what it sounds like to use a nice voice. Go through some common examples of demanding situations you have experienced in your home. Demonstrate a “nice voice,” and then ask your youngster to repeat the voice back to you. Give them a few sample situations where they can practice being respectful and kind. 12. Moms and dads are doing a disservice to themselves and to their youngster by giving in to demands to avoid a scene. Even if unintentional, this teaches the youngster that if his behavior gets severe enough, he will get what he wants. 13. Moms and dads should be prepared to disengage and remove themselves or the youngster if the behavior escalates. Moms and dads must be willing to leave a situation and trust that others will understand and respect their need to attend to the situation. Most people are supportive of a parent disciplining a youngster in a respectful way. Although some people would think this action would violate the parent's right to enjoy an outing, one should remember that parental responsibilities do not end whenever it's inconvenient for the parent to uphold them. The parent needs to remember the rights of others to exist in a peaceful environment, and the youngster needs to learn that unacceptable behavior is unacceptable in all situations. 14. Don’t let your youngster intimidate you. Demanding children feel like life revolves around them. You have to change that. The only way is by saying ‘no’ to some of their requests. This means we have to stay strong and not give in. Stick to your guns. When we give in to the demands, we have just taught our kids that when they are demanding and relentless, they get what they want. The exact opposite of what we are trying to teach. 15. When kids are young, it’s hard for them to understand the difference between needs and wants. Getting to baseball practice on time is “necessary.” Buying silly putty is “not necessary.” Take some time to explain the difference, and then work to only address the “needs” when your youngster uses a “nice” voice. 16. The middle of a tantrum is not the time to reflect feelings or try to talk a youngster out of being angry. That time has already passed, and the youngster will now interpret these efforts as a denial of his feelings and may escalate his behavior to convince the parent of how strongly he feels. Communication may be futile until the youngster calms down and may even keep the tantrum going by giving the youngster more attention for his behavior. Process what happened, the youngster feelings, and the choices and consequences of behavior after the tantrum is over. 17. There are times when it is best to walk away from the situation and refuse to interact until the youngster's behavior improves. A power struggle cannot occur with one person. Walking away is not giving in. Usually the youngster wants something from the parent, either some service or attention. Walking away will give the youngster nothing and will give him a chance to calm down and rethink his choice in the matter. If the youngster has become destructive in the past, the parent can plan ahead by arranging a safe place for the youngster to go and discussing appropriate ways for the youngster to release angry energy away from others. Remember to tell the youngster specifically what behavior is acceptable rather than wording your statements in terms of "don't". 18. Try to stick with choices within limits unless the behavior becomes even more unacceptable. When this happens, moms and dads can shift the focus from the original issue to the behavior. The parent can present the youngster with a new set of choices (e.g., "You can calm down, or can we'll leave."). Remember to focus on the behavior and not attack the youngster's character. 19. When your youngster does say something in a demanding tone of voice, reflect his/her feelings ("I understand you feel...") before stating your expectation about how it should be said ("...but I expect you to tell me in a calm, polite way."). 20. Be patient with your child as you implement your new parenting strategies. We must implement change gradually because change is tough. People don’t like change, and kids will totally reject parenting changes if they occur too fast. We are a Christian family, and I ask myself quite often how we came to this point. Our son is 17, has been arrested twice in the fall of this school year within a months time for "willful concealment" of something under $5, and the second time for possession of marijuana. We have received phone calls from two local police departments for "mischief" with friends, one of which was never proven and the other he was not directly involved. He is into marijuana and smoking cigarettes and cigars pretty regularly even though we have consequenced, warned and continue to express our rules. In the last couple of months he has snuck out of the house several times taking our car or a friends' in the middle of the night to see his girlfriend who lives almost an hour away. His consequence has been not being "allowed" the privilege to drive our vehicles and has been told not to drive friends cars as well. Each time he sneaks out, delays the period of time in which he will be able to drive. He has only had his license since just after Christmas, and has only earned the privilege to drive on a couple of occasions until he started sneaking out. At this point it has been recommended to suspend his license until he is 18 (he just turned 17 only 2 weeks ago). I am concerned if we don't provide the right consequence or implement one that lasts for too long of a time frame, he will continue this pattern and will feel he has nothing to work towards. We have tried so many approaches for our son; consequences, rewards, goals, etc. I feel like the window of opportunity continues to close as he gets older and approaches 18 in a short year's time. This is only a small snapshot of the behavior and frustration we have experienced with our seemingly oppositional, strong-willed, highly defiant, adhd son in especially the last year and a half. I am tempted to purchase your book but I think our problem may have gone beyond anything we can do. We have a 12 year old boy whom we adopted at the age of 14 months. He knows about his birth parents his birth mother is my niece and his biological father is incarcerated indefinitely. He met him once about 2.5 years ago in prison. I implemented a consequence last night in a calm manner, explaining the reasons for it. He turned our home upside down, kicked punched and slapped me, drew on the walls, screamed and yelled, threw things at me. This went on for over an hour, his constant intent to provoke something. We remained calm throughout. (We being my 26 year old son and I) As soon as my husband arrived home from working over 15 hrs my 12 year old started on him. You may ask why I didn't call the Police. (we have on one other occasion) I didn't call them because I dont trust our Social Services system here in New Zealand to place him in a safe home for respite.. I did not want him to think we had abandoned him as he had been as a baby. He shows no remorse and no empathy. He is manipulative and calculating when this behaviour is happening. If you say something like "you shouldn't have done that" he takes up the challenge and does it with more intensity. He wont back down. We are booked in to see a Psychologist on Monday as his defiant behaviour is now becoming an issue at school. He is also incredibly obsessed with his image, always looking in the mirror posing and preening nearly verging on narcisisim and yet this child is witty, can be good company and is very talented. We are at our wits end physically and emotionally. I am 31 years old and have a younger brother who is 17 and finishing his junior year of high school. Our dad passed away from ALS (Lou Gehrig's Disease) three years ago and my mom is now raising him as a single parent. My whole family was rocked by my dad's aggressive and degenerative illness - I know that the trauma of living with his illness and death has had a huge impact on my youngest brother especially. He begain drinking and moking pot in middle school and his grades and attendance at school have continually gonen downhill. My mom was pre-occupied and consumed with my dad and seemed to kind of give up on disciplining my brother. She let him get away with a lot because of our family's situation and because she was exausted and at her wits end. She has tried to regain control through grounding, etc but has not had a lot of success. Their relationship has deteriorated and it has been very difficult to watch them both struggle. Last week my mom caught him smoking out in his bedroom and found a bottle of vodka, she also discovered that he had scuffed up her car and not told her about it. They got into a huge screaming match and she kicked him out of the house. He did not want to leave, but she forced him. He took his car and has been staying at a friend's house. His friend's mom is allowing him to stay there and he is adamant that he will not go home and does not want to live with our mom. My mom is adamant that she will not ask him to come back and does not want him there unless/until he has a change of heart and will change his ways. This is crazy to me. I feel like she needs to get him back to the house at all cost and take some extreme measures to get their relationship, and his life back on track while she still has the chance. I had breast cancer this year , had a total of 4 surgeries, including the breast cancer surgeries, and have?? been on my medical leave for a year. We have no one. He has never had a male role model in the house. We are alone .. We used to go to church, did little league, cub scouts, hiking, kayacking, traveling, camps. He refuses to do anything now. He signed up for football but is not taking any action to go and condition and do what he is supposed to be doing .. I cannot take any of this anymore.. And when one gets to this point,, can a cd help? He doesn't care about anything anyone does for him he acts like he is entitled .. to everything... I dont feel any kind anything toward him right now.. at all... Sometimes it hurts so bad,, what he is doing ,,, I feel like giving up.. I take it onto myself and go into a depression because I dont know how to help him anymore.. nothing works he does not care..... and I dont know why I love him he knows that.. Why doesnt he want more for himself? He is able to achieve so much yet he does nothing with his life.. nothing.. and I cannot force him.